Well, I donated two more blankets to the nursing home. Apparently, they still use them. In fact, the woman in the voluntary services office who accepted the blankets said that the nursing home had been looking for blankets within the past week. And now they have these two! So, of course, I've started another blanket. It's going to be relatively dark: hunter green, navy blue, black coffee brown, and coffee-with-cream beige. Actually... The lightest color in this blanket is the same as the darkest color in the first blanket I made. In other news.... I'm working on a shrug for my mother. Much fun. I have no idea what I'm doing. It's strictly seat of the pants stuff, because I couldn't find a pattern I liked, and I figured, hey, how hard can it be? So I got some yarn, and I found some DPNs in what looked like a good size, and started those long thumbless mittens.... Sleeves, I think they're called. Anyway, I saw my mother this weekend, and measured the sleeves against her arms, and they're fine. Her comment: "Oh, didn't you purl?" I also measured her wingspan, and figured out how much of an opening she would need to be able to get the shrug on. I now have a loop of yarn as a guideline for the aperture. Very high tech, I am.) So the next step is the back, which needs to be 30"/75cm across. I see swatching activities in my future. A few months ago, I inherited some wool from my boss. She knits, and these were things that she was just not going to use. So they're a bit mystery yarn-ish. I saw a pattern recently and thought, hey, I think I have yarn that would work with that. It looks like worsted weight, and it's got two main colors (a solid red-orange and a variegated rainbow) wrapped around a core of two black plies. Applying flame produced a smell like burning hair, and it self-extinguished, leaving only ash. My guess is 100% wool, at that point. So I've just started Brooke Nelson's Column of Leaves Scarf. At least, I hope it'll be a scarf. I'm not sure how much yarn I have, so it might be a swatch. My mother's comment to that was, "Oh, your grandmother liked that leaf pattern!" And I can see why. I'm not a natural line-by-line instruction type. I prefer charts. When I charted out the pattern, I could see how the leaves just grew on top of each other. Very simple, very regular, entirely elegant. Those are beautiful blankets you have made. They're crocheted right? 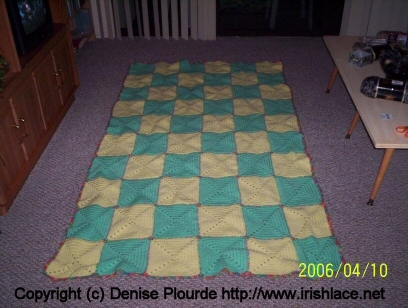 I am working on my third blanket - knitted - for the online group "Blankets for Canada". They go to the homeless. Isn't it great to know our work is keeping someone warm? Thank you, Janey, and yes, those are crocheted. 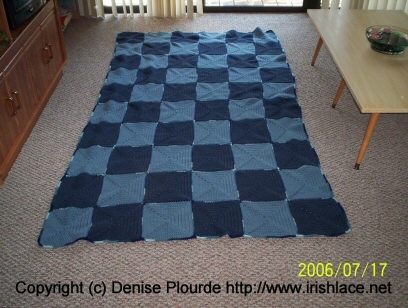 I discuss them (and other blankets made the same way) at http://www.irishlace.net/blankets/ . I agree; it's a good feeling knowing from the start that something I make fills a need.